I recently did an interview with the LADbible, because for some reason they wanted to speak to me about zombies. Whatever, it’s press. They posted a redacted version of the following piece, but I wrote the whole thing, so I might as well share it. Who are you and why should anyone care? I’m an honorably discharged Marine with two Iraq tours, and have since become a writer and manage a page called the War Elephant. I mostly focus on the military, geopolitical stuff like who we are fighting and why, as well as strategy, and tactics. I also write on some politics. What did you do in the Marines? I ended up becoming a Marine Marksmanship Instructor, which meant I trained on most of the Marine Corps infantry weapons systems and trained hundreds of others on them, as well. So you got to use those skills in Iraq? Nope. My unit transitioned to a base defense unit where we were posted to security for a large air-base in Iraq. For the types of insurgents we fought, it would have been an even bigger suicide mission then normal. In the wisdom of fate and the Marine Corps, years of training left me and the four hundred other Marines in my unit trapped in guard towers, and as gate guards, logging vehicles that came in and out of the base. It gave me a huge sense of fulfillment to be a glorified toll booth clerk… huge. So how did you become a zombie specialist? After the war, during college, I started writing. It started mostly explaining the war because, at that time, the only people sharing knowledge about it had absolutely no experience and had no idea what they were speaking openly… unfortunately. I may not have been kicking in any doors during my stay, but if you live in foreign country engaged in a moderately significant point in its history, you are going to pick up a few things. From that point on, I was on a personal mission to fix the internet. Progress has been slow. That opened the door to writing on the other conflicts throughout the world: Ukraine, ISIS, Syria… basically everything sad in the last decade. From time to time, after talking about nothing but war, you need to unwind. Rather than fishing, I keep writing, but I succumb to the absurd. I engage my regular readers with extremely hypothetical scenarios they propose. A few of these were answering what would happen if the Marines besieged Cinderella’s Castle (I called that one Operation: It’s a Small War After All) and who would win between Star Wars Storm Troopers and Star Trek Red Shirts (the answer is Darth Spock, if you’re curious. ) Eventually, I found my way to answering followers’ questions about zombies. Eh, everyone needs a hobby. Zombies are great from a hypothetical strategic planning perspective. Think about it. You have an aggressive and unpredictable light infantry insurgency force with infinite capabilities to recruit if given access to urban centers. Direct combat is less effective than counter-insurgency. Allies must meet these forces with adequate regional counter-insurgency measures within hours of the conflict’s commencement, or else the defending forces face an exponentially worsening threat. All this, while also incurring exponentially greater civilian casualties and losses to civil infrastructure as the cost of prolonged failure. If planners in a hypothetical test bed solve that problem, then wars like Iraq would have been remembered as one of America’s greatest strategic victories, rather than the birthplace of what could be called the zombie caliphate. It’s actually a big enough problem, and a cool enough challenge, that there is a real document floating around where military strategists gave a shot at preparing a rational Zombie Defense strategy. They said it was for “training purposes”, but we know better. So yeah, thinking about zombies is a fun way to explore real world combat and geopolitics from a different angle. Fair enough. So if a zombie attack were to actually happen today, would we make it? I mean, what are the zombie’s capabilities. Are they slow or fast? Can they be killed? (“How?” is a good follow up.) How is the condition spread? Do you have to be bitten or is it a virus we can carry for years? Can they cross large bodies of water? Is it possible that they may evolve into a higher order of monster once they’ve consumed enough human flesh, such as werewolves, vampires, or the la chupacabra? All of it is something we will have to factor into a reasonable guess on if we make it or not. And consider it like this, are these zombies just rabid humans who spread the disease through biting, but are otherwise prone to the natural human problems of bleeding to death and starvation? That gives us options… mostly hiding, but still options. Or are they something worse? Are they truly undead manifestations of horror, brought back by some malicious magical force? Look, if your hearts not pumping, then your blood isn’t flowing. If your blood isn’t delivering oxygen to your brain, then nothing is telling your muscles to move, not to mention that the muscles don’t work either from lack of nutrition or getting bitten through by another Zombie. Biology matters. The body is a system. You can’t just say, “It’s dead,” and then not be surprised when it keeps on going without half its limbs and no pelvis. The universe just doesn’t work like that. That means that the zombies that are truly walking around dead without their vital organs intact are ran by magic and that just changes everything. How do you fight something magic, because hacking at it with a sword and a crossbow aren’t going to cut it against a horde reanimated by dark magic. We’re going to have to find that crazed wizard in the forest with this Necronomicon of evil sorcery and put an end to this reign of unholy terror. And if the dead are truly walking around eating people, visiting our worst nightmares upon society, we can’t rule out that we could be dealing with some underworld level stuff here, as in some real unholy horror. In such an event, I should think some stumbling bumbling monsters that are literally falling apart are not so bad when we should expect a flood of demon locusts to descent upon humanity to smite us from the fiery chasm of Hell very shortly. But maybe it’s not magic. Maybe we are dealing with some sort of evil nano-technology that has replaced all bodily human functions… and somehow went evil in the process in an attempt to replicate? If that’s the case, which government agency do we blame? (I blame the Department of Agriculture. No one ever suspects the Department of Agriculture, and that’s what they’re planning on.) Bigger question, is there a shut off somewhere, or what it someone the DoA (interesting acronym, huh?) wanted the apocalypse? Or worse, what if the pestilence of purification comes from advanced aliens, who figured out this is the best way to beat us? They’ve seen all our movies and know that no matter how ungunned by the super intelligent aliens with their space ships and death rays we always win, yet throw a herd of stupid and slow moving murder cattle at us with a logarithmic capacity for genocide, and we crumble. Yeah, we handed over the keys on that one folks. I’m just sayin’, know your enemy. So assume we are dealing with a dumb, slow, undead zombies. Would that easy? Okay, we can work with that. As far as that goes, exponents matter. The speed of growth and spread are going to matter, but in general we ought to be okay. More than likely, it seems difficult for me to believe that a single patient zero would have a great deal of success walking around aimlessly against people smart enough to run away from, or at least walk briskly away from such a stupid creature. It seems a bit much to believe that we wouldn’t be able to contain that in the first town before the outbreak reaches critical mass. Of course, knowing the Department of Agriculture, they’ll probably weaponize the disease into something like fast moving, much smarter hunters of the living. Okay, so we are dealing with fast moving, much smarter hunters. Oh, then we’re screwed. Perhaps not all of us, but civilization as we know it is screwed. From this point, we’re looking to where we could geographically find the safest place to build up a defense. That’s going to mostly be a battle of luck because if you are in the wrong place at the wrong time, well… you’re about to join the other team. What do mean by the wrong place at the wrong time? Like I said, it comes down to geography. This was the subject to an piece I wrote on how your environment can contribute greatly to the success or failure of a survivor’s odds of staying alive. Certain environments fair better when you think about it. Obviously, a city is a death trap and don’t even hope to escape in time. Highly cramped and offering little long term places to hide, along with the fact that there will very quickly be no food, water, or resources of any kind left to scavenge, cities are the last place you want to be. I’m just saying, if you live in an urban area, then you hear of a zombie event happening, don’t even bother with figuring out an escape plan. Just start basting yourself and accept the inevitable. That said, while most of humanity doesn’t live in cities, most of technology does, so all of us who rely on what comes out of them better start becoming a lot more independent really fast. That means no satellite news, no digital anything, and no logistical support (like your fancy department stores or Uber.) All that is going out the window. Even things you think of being from the rural areas, like farm produce and oil, someone in cities is managing all that. There is going to be a time where their bodies are still fresh and no one is making the calls that get goods from the people who have them to the people who need them. Assuming we get the resource problems under control, move a bit farther out, and areas like the plains don’t look so bad anymore? Sparse and spread out population centers, lots of open flat terrain to see enemies coming from far off. Yeah, maybe investing in a little land in Oklahoma wouldn’t be so bad after all. They’ve got some lovely lakes with lots of fishing. Beyond that there are mountainous areas, like Colorado. Insurgency warfare taught us a lot about hiding in mountains by being on the receiving end of those who do. You may not be able to mount an offensive, but you can securely hold up there for year. As long as we have a food source, a few survivors could hold a mountain pass indefinitely. Deserts might help speed the decaying process, but forests will provide the undead just as many opportunities to corner us as it would provide us against them. Jungles are great too, because they allow for the vegetation, jungle rot, bugs, and other predators to slow down and make short work of the demon spawn, all dangers humans can learn to avoid. Generally, look to nature. When you are dealing with an unstoppable enemy, you want the terrain to do the hardest work for you, so looking to places with the most natural barriers is always the best way to go. We can talk about manmade defenses, but eventually, bullets run out, people get surprised by a stray bite, training accidents happen, fatigue or stress drives some to insanity, and the infantry starts falling back on the second string guys. At that point guards fall asleep on the tower, or someone leaves the gate unlocked and if humanity was your only option, the humanity is screwed. Basically, the sooner you learn that humans are unreliable creatures in the long term and that someone will screw up eventually, the sooner you’ll start relying on defenses that can’t change, like a narrow pass flanked by high cliffs, or a deep river. While mountains, rivers, and jungles seem like the best defenses to begin with, the best by far is thousands and thousands of miles of ocean water. If you happen to live on some tropical island far, far off to sea and you hear news reports of rampant viral outbreaks, cannibalism, and then suddenly nothing but radio silence… just stay there. You’ll be okay and civilization is now kind of depending on your lack of curiosity and selfishness, at least for the time being. If you do still have contact with the mainland, you have the benefit of any of the contaminated being discovered on a plane ride over, or in the days and weeks that it might take for a boat to arrive. So where would the best places be? If I had to pick one place to be, it would be Hawaii. It combines a lot of the nice-to-have list for geographic security; lots of oceans in every direction, and even if the worst were to happen, the islands are covered in high mountains and thick jungle for the survivors to retreat to as a final fallback line. Hawaii is also special because, being presumably the last holdout of the once great American Empire, it will inherit perhaps the most valuable asset yet remaining in the world that zombies will have little effect on, the United States Navy. Equipped with just a touch of security, I would predict following any zombie apocalypse, Hawaii would become the new global seat of power, consolidate the future island nations of Earth into a unified government, and one day be the force which takes back the rest of the planet. So what about the individual? What can we do improve our own survivability? Not a lot. You’re probably going to die. So there’s nothing we can do? I’m just being honest, but sure there are things that could improve your chances. Do you work out? Awesome, I mean, you’ll taste a lot better with all that juicy muscle tissue, but at least the zombies will have earned it. Martial arts experience? Eh. I have a black belt, but if I were to really think about going hand-to-teeth with a zombie, I’m sure I would win, but I’m going to get bit, scratched, or whatevered into becoming one myself. You definitely don’t want to go that route. Guns? Guns are cool. You want to survive? You better make friends with your scary 2nd Amendment buddy with more ARs than you have rooms in your house. And yeah, guns need ammo, but if you’re nice to him, he’ll teach you how to make bullets too. Then you’ll have a tradable skill in the apocalypse. Stick with that dude. That dude’s a survivor. They’ll probably make him the mayor of Survivoropolis. If you’re really curious about your odds, I’d suggest one of the online tests of survivorshipness. Don’t go with one of the zombie ones though. As we’ve already shown, what we mean when we say “zombie” can vary wildly, so it’s better to test your survivorship skills against something more objective, something that exists in the real world that we can measure – something like Justin Biebers. Anyway, there’s a good test out there to test how many Justin Biebers you could take in a swarm. There used to be a really great one for 5th graders, but I’m thinking the special snowflakes killed that one. I got 29 Biebers, but that didn’t factor in the Marine Corps stuff, so I’m thinking I could do better. Either way, we can objectively measure the fighting strength of one Justin Bieber, and that should provide us a good metric for where we stand against the zombie in our scenario. I’d say take the number of Biebers you could take on and divide that by 5, and you should be somewhere in the woods of the size of a swarm you can survive by yourself. So, basically we have no chance? Awesome. Well, there is one thing people need to keep in mind. So much of zombie horror is the destruction of society, that monolith of community that we have erected which we can’t imagine ourselves without. When we place ourselves in a zombie apocalypse, we always imagine that we will be one of the last hold outs, a lone survivor wandering through the woods with no support, and no anchors. If we live our lives like that, we won’t be one of those survivors, though. We’ll just be another half-eaten face in the crowd. No, if you want one skill to develop to survive, it’s leadership. This sounds like the warm fluffy portion of the article. No, I’m serious. The only way you’re going to make it, on one level or another, is to learn how to work with other people as a team. Think about it. Imagine you’re a former Navy SEAL and a survivalist geek. You know how to be stealthy, and keep your cool in a tough situation, and you’ve also learned to live off the land. You’re also armed to the teeth. Think you’re well prepared to endure the end times? Eventually, you are going to run out of bullets, find a horde you can’t escape from, or meet a situation your training alone wasn’t enough to help you get through. Of course, an even worse situation is that you don’t. Maybe that doesn’t happen, and you just keep going on, and on, forever. You still have to deal with a universe in which you are the sole survivor and there is no point or meaning to your life besides this horrific existence. Even if you haven’t read the works of Friedrich Nietzsche, the ramifications of existential nihilism are going to creep their way into your mind, and in that world of absolute narcissism, if the zombies don’t get you, your own bullet to the grape just might. The point is, whether you are a master survivalist or whether you just get lucky, going it alone means you’re just as dead as the rest of us. You gotta know how to get along with others. You’re going to have to learn to work in a group under stressful situations. Being friends matters, because you’re not going to have all the skills needed to last forever. Someone is going to get sick and need care, you’ll need an engineer, you’ll need a gatherer, and you’ll need a few fighters to kill zombies and keep others alive while doing it. You’re going to want those friends eventually, but what a group like that isn’t going to want is the selfish individual. You take your lone wolf, every man for himself crap and throw it into the death pit. 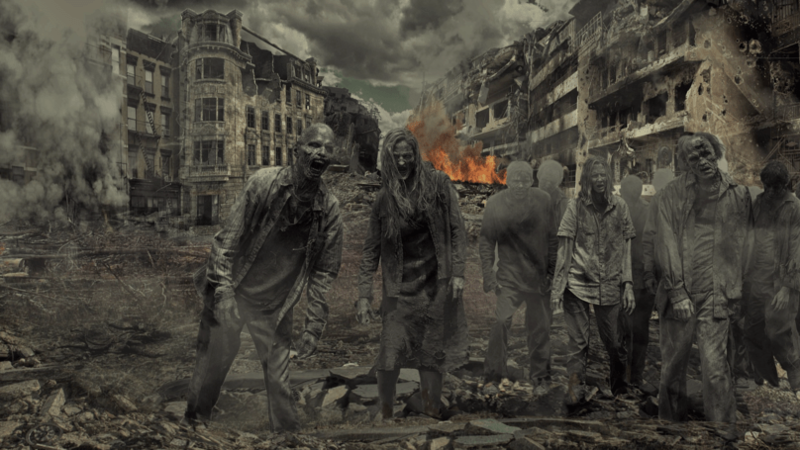 The in-group will be quick to punish and maybe even exile individuals, as the zombies will mean that survival is no longer a matter of individual effort, but where one actually needs to think of the group’s survival as necessary for their own. Play nice, or your tribe is going to make you zombie chow, not because they’re bad, but because that is what is best for the tribe. Having made friends, you’re going to need to learn to teach others. Having a skill is great, but sharing that skill with others is greater, at least for the group’s survival, which as we said, was best for you. You know how to defend yourself? Awesome, but six of you defending yourselves together can take on exponentially greater threats to your collective survival. Educating others also multiplies the vital skills in your groups, meaning that if one is unfortunately gone the way the meat pie, then the others don’t lose the vital knowledge they had. Beyond that, you’re going to need friends to help you build the walls, friends to help you gather and eventually raise food, and friends to help distribute it all. Look, I hate Socialism, but in the end times, there’s gonna be a lot of sharing. Finally, you’ll need ambassadors, because friends are good, but civilization isn’t going to rebuild itself. You’ll need networks of survivor groups connecting resources across regions. That’s why the ultimate necessity for survival is and always will be leadership, the ability to pool the talents of individuals and create action in others. Ok, so last question. You’ve collect your team of survivors. How would you make it out? Well, you’re going to need a shovel. Yeah, a shovel. Look, surviving is a long-term plan and if you aren’t lucky enough to be born to a hula girl who was the daughter of a wealthy cattle rancher in Honolulu, you’re going to need a strategy. Having the means to fight back is always good, and being a good leader will keep you alive, but humans eventually fail, even if it is just from fatigue and stress. That’s why you want passive defense; systems that protect you without you doing anything about it. Walls work, but zombies can get over walls. They can stack up on top of one another in mobs and scale them. Walls can also always come down. You’re not going to be having a very good day if that was your plan. No, what you need for an enemy that is both unstoppable and incredibly stupid is to reshape the terrain to move the walking undead away, meaning that after a bit of sweat, you never have to worry about it again. You should look up how the Romans fought. They were the world’s greatest army up to their time and ruled for over a thousand years. They did that through military might, but the way they fought though, was a mastery of earthworks. People should look up the Siege of Alesia. Wicked smart stuff. Anyway, the way you secure yourself isn’t a wall, and it certainly isn’t a security team rushing to the defense every time a minion pops out and snags one every couple of weeks. You need a pit – a big, unavoidable trap which the dead can drive themselves toward, and fall unmercifully to the bottom. Might be good to divert a stream or something through there to clean up the goo, though. If it were me, I would surround my colony with a deep trench. That should provide for defense, but to clear the area, I would throw in some loudspeakers powered by solar panels and running on automatic timers along a road leading to the colony. When I say “some loudspeakers,” I’m talking about miles of them. Every now and then, one would turn on, blaring out a message to any survivors wondering around about how to find the colony, and maybe something whimsical and ironic. I’m thinking Highway to Hell by AC/DC. And yeah, you guessed it, some of the dead are going to make their way into earshot and head toward the speakers. After twenty minutes or so, the speaker shuts off and the next one toward the colony trips on a few hundred yards down the road. The cluster gravitates toward the sound as more zombies join. On and on they go until the now decently large herd reaches the cliff. What’s on the other side? Another speaker, tempting the ravenous horde. While they may not make the leap, an interesting thing about crowd dynamics is that those in the back have a way of pushing that the beasts in the front may not appreciate. As the horde builds in size, the force pushing on the zombies near the edge is enough to push them over. As the zombies in the rear push forward to become the zombies in the front, which are replaced in turn, the deep canyon below will become the greatest zombie killer in the world. Where a great human zombie hunter may succeed at maybe a hundred before his luck runs out, AC/DC and a big hole in the ground will keep killing zombies without anyone ever needing to lift another finger… granted the water keeps flowing to flush them out, of course. This is the beauty of passive defense systems. They are harder to set up, but the systems do the work better than you could and they never stop working. A zombie world isn’t going to be one where heroes fight tooth and nail to beat back the horde. The more they do that, the more the horde takes the best and brightest that remain. What the zombie apocalypse is going to require are engineers, engineers and smart leaders to guide them. Guns also wouldn’t hurt. Jon Davis is a Marine veteran writer and blogger. You can follow Jon’s page, the War Elephant, at War_Elephant.com, or on Facebook, Twitter, and his soon to be launched YouTube Channel The War Elephant. You can also follow his answers on Quora. He’s also very poor and funded through the crowdsourcing platform Patreon. To donate a to keep his lights on a stable internet connection, please visit his patreon campaign.